Offred’s descriptions of what it was like to live in an abandoned school and why a group of young, fertile women had been enslaved in the first place captured my imagination. There was grief, loneliness, and pain etched into every thought this protagonist had even before I had any idea what was going on with the characters or setting. The writers for the TV show based on this novel have done a superb job of fleshing out the storyline so far. While I’m waiting to see the next episode of this show, I’ve been thinking about books that have similar social justice themes and writing styles to this one. If you enjoyedThe Handmaid’s Tale, you might like these titles as well. 1. 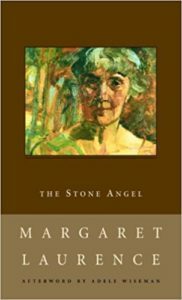 The Stone Angel by Margaret Laurence. 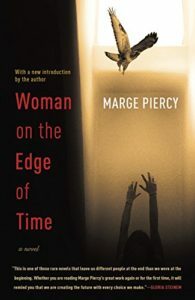 I’m tentatively planning to talk about Margaret Laurence’s work again this summer in a Canadian-themed Saturday Seven post, but I had to include her in this list as well. The main character of this book was someone whose choices in life were severely limited due to abuse, poverty, and being born into a society that had pretty limited empathy or help available for women who found themselves in difficult circumstances. I should warn you that Hagar wasn’t an easy character to like at times. Her harsh life had shaped her into someone who could be abrasive under certain circumstances, but I still saw glimpses of the young, hopeful girl she’d once been no matter how difficult she was to love at the end of her life. 2. 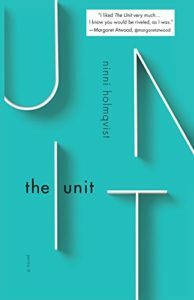 The Unit by Ninni Holmqvist. Fertile women in The Handmaid’s Tale were forced to bear children for powerful infertile couples. Characters in The Unit were forced to donate their organs to strangers even if doing so lead to their immediate deaths. Both groups of people were simultaneously shunned for “sinning” against the impossibly-strict rules of their societies while also being told their suffering was worth it for the greater good of humanity. 3. 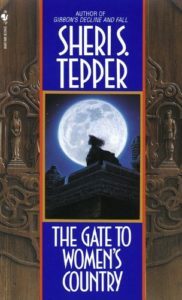 The Gate to Women’s Country by Sheri S. Tepper. If you can only read one book from this list, make it this one. Fertility was controlled in The Gate to Women’s Country just as strictly as it was in The Handmaid’s Tale. The difference between the two lies in how well women are treated otherwise, who raises the children they conceive, and how (un)aware they are of what is really happening to their bodies. 4. 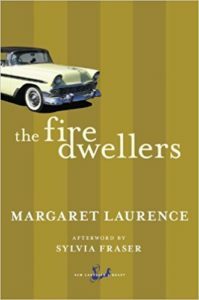 The Fire-Dwellers by Margaret Laurence. I read this so long ago that I’ve forgotten a lot of it. I feel compelled to reread it again soon. What I remember the most about it was the fact that two people could remember the same event so differently. There’s no doubt in my mind that Offred’s account of what happened to her wouldn’t be the same as the men who drafted the laws that made all sorts of human rights violations legal or the wives of the high-ranking members of The Republic of Gilead who ignored the abuse of women like Offred because of how much they stood to gain from the arrangement. This isn’t to say that any of the supporting characters in The Fire-Dwellers are violent like the ones in The Handmaid’s Tale, only that empathy isn’t a skill everyone develops in life. Such a lack of empathy can show up in both small and profoundly serious ways. 5. 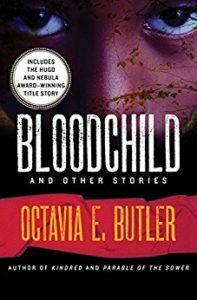 Bloodchild and Other Stories by Octavia E. Butler. Honestly, I could have listed many of Ms. Butler’s books here. The things she had to say about prejudice, how power can be horribly misused, and what happens when one group of people oppresses another over a long period of time fit in beautifully with the themes in The Handmaid’s Tale. 6. 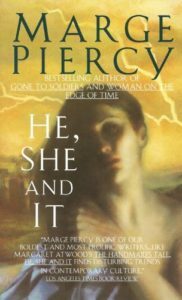 He, She, It by Marge Piercy. This book didn’t arrive from the library in time for me to read it before this post went live, but I’m looking forward to seeing how the main character handles a custody dispute that’s mentioned in the blurb. It reminded me of how Offred pined for her daughter after they were ripped away from each other. 7. 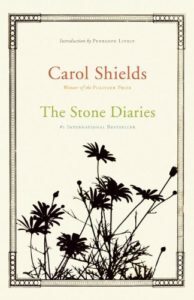 The Stone Diaries by Carol Shields. Once again, this book hasn’t arrived from the library yet. I like the idea of a female character telling stories about her life that are typically the sorts of things someone wouldn’t talk about. While this narrator had a much happier and safer life than Offred did, there were still parts of it she regretted at the end. I think there’s something to be said for talking about those things openly sometimes instead of hiding them. How many of my readers are fans of The Handmaid’s Tale? Do you enjoy books about social justice in general?